The young filly showed great promise every time she ran a race. Many believed she would be a prize winner. But she never got the chance. In June 1950, North Korean troops stormed across the border between South Korea in a surprise attack that changed life on the Korean Peninsula. It also brought the sport of horseracing to a standstill. With no races to run, owning racehorses became a financial liability for their owners. Like many others, she was abandoned at the Seoul racetrack. A young Korean stable boy named Kim Huk Moon took over feeding, watering and grooming her. 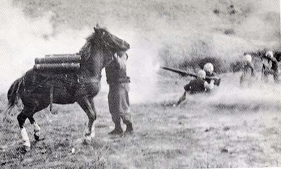 In October 1952 some U.S. Marines from the 5th Marines’ Anti-Tank Company’s Recoilless Rifle Platoon discovered the young filly and decided she’d be valuable for carrying supplies into combat. The platoon leader, Lt. Eric Pederson, paid $250 of his own money to buy her. The only reason Kim sold his beloved horse was so he could buy an artificial leg for his older sister, Chung Soon, who lost her leg in a land mine accident. Because she would be transporting the Recoilless Rifle into battle, the Marines decided she be named Reckless. During her training, she quickly became a unit mascot and allowed to roam freely through camp. On cold nights she slept in the Marine’s tents. She was known to eat anything and everything. Among her favorites were scrambled eggs and pancakes in the morning washed down with a fresh cup of coffee. She also loved sweets of all kind: cakes, cookies, even the hard chocolate bars that came with C-rations. When she got bored she was known to eat blankets, hats, even poker chips. But her bravery under fire and her innate intelligence in numerous battles made her a hero. Learning each supply route after only a couple of trips, she often traveled to deliver supplies to the troops on her own, without benefit of a handler. One of Reckless’ finest hours came during the Battle of Outpost Vegas in March of 1953. This particular battle, according to one writer “was to bring a cannonading and bombing seldom experienced in warfare … twenty-eight tons of bombs and hundreds of the largest shells turned the crest of Vegas into a smoking, death-pocked rubble.” Reckless was in the middle of all of it. In a single day during the battle, she made 51 trips on her own, carrying over 9,000 pounds of ammunition and walked over 35 miles through open rice paddies ignoring the sounds of battle as artillery exploded around her. 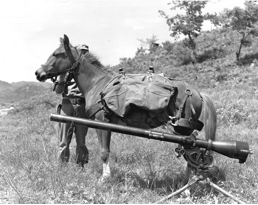 When she returned to the ammo dump, she often carried wounded soldiers down the mountain to safety, unload them, get reloaded with ammo, and off she would go back up to the guns and the din of battle. She also provided a shield for several Marines who were trapped trying to make their way up to the front line. Wounded twice, she didn’t let that stop or slow her down from carrying out her duties. She was given the battlefield rank of corporal in 1953, and then a battlefield promotion to sergeant in 1954, several months after the war ended. 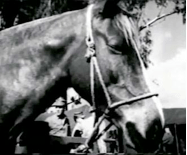 She also became the first horse in the Marine Corps known to have participated in an amphibious landing. Her military decorations include two Purple Hearts, Good Conduct Medal, Presidential Unit Citation with star, National Defense Service Medal, Korean Service Medal, United Nations Service Medal, Navy Unit Commendation, and Republic of Korea Presidential Unit Citation, all of which she wore proudly on her red and gold blanket. Sgt. Reckless was a household name in the 1950s earing her media coverage that rivaled attention bestowed on other famous animals, including Lassie and Seabiscuit. Her wartime service record, featured in The Saturday Evening Post, and LIFE magazine, recognized her as one of America’s 100 all-time heroes, alongside George Washington and Abraham Lincoln. When the war ended in 1953, she was retired and brought to the United States to live out her retirement years at Camp Pendleton. Her popularity continued where she made appearances on television and participated in the United States Marine Corps birthday ball. 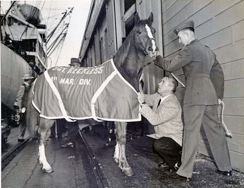 A horse so heroic during the Korean War, she was officially promoted to staff sergeant in 1959 by Gen. Randolph McC Pate, the Commandant of the Marine Corps. 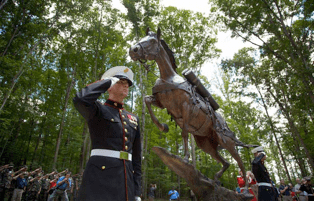 Seventeen hundred Marines marched in her honor during her promotional ceremony. Sgt. Reckless was well cared for and treated as a VIP during her time at Camp Pendleton where she produced four foals. She developed arthritis in her back as she aged and injured herself on July 13, 1968, by falling into a barbed wire fence. She died under sedation while her wounds were being treated. At the time of her death, she was estimated to be 19 or 20 years old. Although so famous in her day, she is mostly forgotten by history. Author and screenwriter Robin Hutton is doing something about that. Upon hearing the horses’ story for the first time, she got goose bumps. She is quoted as having said, “When I first heard of her story eight years ago, the first thing that came to my mind was why haven’t heard of this horse before? She should have had at least three movies done on her. But when I Googled her name, there was nothing on her. It was a travesty and I started writing a screenplay and later the book ‘Sgt. Reckless America’s War Horse. '” The book is due out in August. Documentary filmmaker Victoria Racimo is marketing it to HBO. Racimo’s short documentary of Sgt. Reckless was shown at the 2014 Kentucky Derby and together with Hutton they succeeded in having a race named and run in her honor during the 8th race at Kentucky Oaks. Robin Hutton also led the effort to see Sgt. Reckless immortalized in bronze. “I just thought she needed to have a monument so people would forever know who she was,” Hutton said. A statue by sculptor Jocelyn Russell of Sgt. Reckless carrying ammunition shells and other combat equipment was unveiled on Friday, July 26, 2013, in Semper Fidelis Memorial Park at the National Museum of the Marine Corps, one day before the 60th anniversary of the Korean War. There is a lock of her tail hair in the base of the statue.